Write up a MVP interview script to help you conduct an interview with your users to find out what they think of your MVP. While analytics can give you the macro picture of how your customers are behaving. A better way to understand more about them is to actually just ask them by carrying out an interview like the ones we did before with problem interview and solution interview. 1. Is the landing page attractive - do they want to keep going? 2. Do the customers make it through the activation flow (usage cycle)? 3. What features are the most popular? 4. Does your MVP deliver and demonstrate your UVP? Hey, thanks for meeting with us again to help us with our startup. We are almost done with our product and we'd love to get your feedback on the product. In return we'll give you early access to the product. Cool? We'll run a short interview to ask you about the usability of our product. I'll start showing you the website and ask you a couple of questions. It'll be really good if you could think out loud as we go along. That'll help us identify any problems we need to address. Look at the home page, and let me know what you think of it. Don't click anything yet. - Is it clear what what our product is? - What would you do next? - Are you still interested in trying out this service? - What did you think of the process? - Is there anything we could improve on? - Do you know what to do next? Thank you very much for our time today. If you have any questions or run into issues, please let me know. Would it be okay for me to check in with you next week? 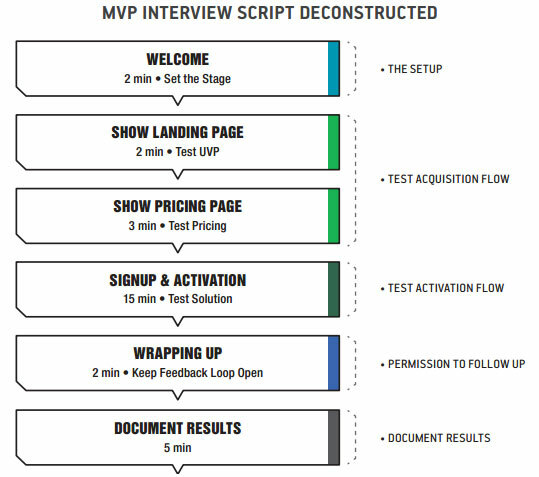 Please check out Ash Maurya’s MVP Interview Script Deconstructed from "Running Lean" for instructions on a more comprehensive interview strategy.